Last Wednesday, Patrick Ritchie sat his final school exam – and now the teenager is keen to keep learning in a cricketing sense with Mazars Grange this summer. The 17-year-old is entering the final weeks of Senior 6 at Stewart’s Melville College having completed a history exam this week to bring to an end his formal education. However, his education on the cricket field is just beginning. With Harris Carnegie out injured, Ritchie was handed the wicketkeeping gloves for Grange’s win over Watsonians in the CSL Eastern Premier Division last Saturday. He will also be donning the gloves at Gilvenbank against Glenrothes tomorrow as the Portgower Place men aim to keep their unbeaten start going. Also a handy scrum-half on the rugby field, Ritchie has come through the age-grade ranks at Grange and is loving testing himself at first XI level. “I have been involved with the first team before at stages over the last couple of years, making my debut in the Masterton against Carlton in 2016 and then making my league debut against Stewart’s Melville last summer,” Ritchie said. “However, it was great to be given another chance in the top team last week and I really enjoyed it. “Having been at Grange since I was young I have been lucky to learn from some great senior players in that time and a lot of those guys are still in the first team now. “I love playing in this team because we have a laugh, but concentrate when we need to and there is just quality throughout. “The batting depth in the team is very strong while there is good variation in the bowling attack and for young guys like me to come into a side that includes Scotland caps like Preston Mommsen, Neil McCallum, Gordon Goudie and Ryan Flannigan is a big help. “Club coach John Blain has also really helped me over the years and to know that [ex-England player] Ryan Sidebottom is coming later this summer just adds to things. 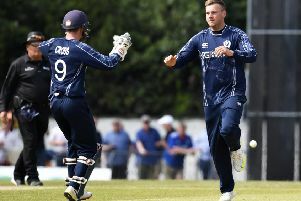 People often compare wicketkeeping to goalkeeping and believe you have to be a certain type of character to enjoy the role, but Scotland Ritchie loves being behind the stumps. “It is great to be involved with every ball of the opposition innings. You have to keep switched on, but it is a challenge I enjoy and am looking forward to getting more games under my belt going forward,” he stated. As mentioned Grange, currently in second place in the table, head to Fife to play Glenrothes tomorrow. With the team due to have had a Masterton Trophy outing last night, the final XI will be named today by skipper Mommsen. Leaders Heriot’s have the luxury of naming an unchanged team as they head for a tricky clash at Forfarshire. Forfs have won two from three and key to Heriot’s hopes will be spinner Ryan Brown who has six league wickets to his name in 2018 already. Carlton will be looking to bounce back from last week’s loss at Heriot’s when they welcome Arbroath to Grange Loan. Wicketkeeper/batsman Elliot Foster returns for RH Corstorphine as they get ready to host winless Watsonians at East Barnton Avenue. Stewart’s Melville are also winless to date and they face a trip north to take on Aberdeenshire at Mannofield.